brainylady: Blanket progress report: "Interesting"
I added a few rows to my latest obsession, the crocheted blanket, using leftovers from my Must Have Cardigan, my So-Called Scarf, Bill's Leafs socks, and my Backyard Leaves scarf. Bill looked at it and said, after a significant pause, "You have an interesting way of putting colours together sometimes." I said, "Thank you." OK, back to work. I'm revising a paper and trying desperately to stop thinking about crocheting! Who am I? I love the colors. Sorry, colours. I think a vintage striped crocheted blanket is meant to be a little...strong. The window is completely beautiful. Here it's just rain, rain, and more rain. i love the colours too! the greens are so pretty together. you're concentrating on crocheting the blanket because if it keeps snowing like that over there you will need it just to get to class! A haiku! Very clever, Grasshopper. Obnoxious colours? Aren't crocheted blankets supposed to be like that? I must confess I've never seen any that are not psychedellic...Happy Friday! The too tight foundation row can often be straigten in blocking. I have done this in scarfs, and it came out okay. I think your color sense rules! uh oh! alison's been taken over by a crochet pod! the crochet pods have landed! yep, alison's right. foundation row or chain. i have this same problem a lot of the time and i find it easier to make my foundation row with a hook that's two sizes larger. either that or i just make the foundation chain REALLY loose. i'm a sleeve swatcher too. just two days ago i started a swatch for a new sweater, even though my current one isn't yet finished! is your paper done yet? 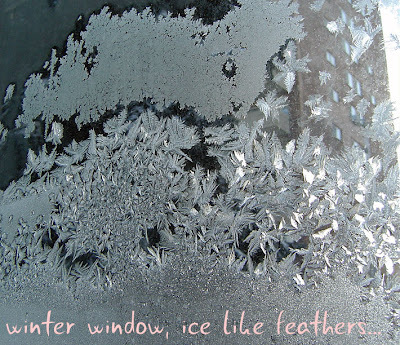 I never tire of photos of feather-y ice esp. since it is something I almost never see in real life! 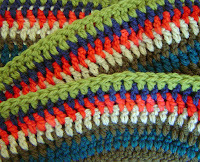 Jenny started crocheting squares yesterday. I briefly considered starting a crochet hat but then remembered the frustration I felt last time I crocheted. Another day . . . I really dig those colors, too.